Do you have a Willamette Falls story to tell? Next month, Clackamas Community College, Rediscover the Falls and the Willamette Falls Legacy Project invite you join the second and final three-day digital storytelling workshop dedicated to stories about the Falls. The first was held in February. 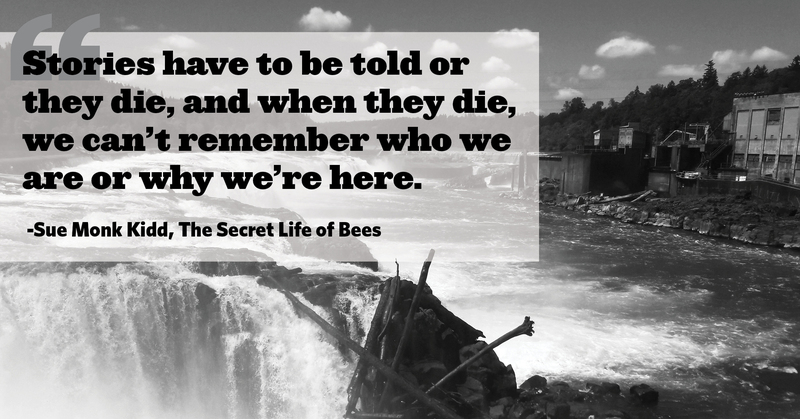 The Willamette Falls Storytelling Project creates an opportunity for community members who have an attachment or connection to Willamette Falls to tell their stories. Sue Mach and members of the Clackamas Community College English faculty are facilitating the free workshop, which welcomes up to fifteen people and takes place over three-days at Clackamas Community College in Oregon City. No experience is necessary to participate; you just have to have a story to tell. During the first day-and-a-half, participants will respond to story writing prompts and write a short narrative about some aspect of their experience with Willamette Falls. They’ll then record the narrative, and on the final day, they’ll compile images and music and edit their story to create a short film using an online editing platform called WeVideo. We look forward to hosting a film viewing at the Oregon City Public Library later next month where participants from both workshops can showcase their work to family and friends. Friday, May 4 from 10 a.m. to 5 p.m.
Saturday, May 5 from 10 a.m. to 5 p.m.
Sunday, May 6 from 10 a.m. to 3 p.m.
To register for Workshop 2, click here (you’ll be redirected to Clackamas Community College’s secure website) and follow the directions below. You will see ZHWL-100-1600, Writing & Story Development for spring term, near the bottom of the page. Click on the box at the left. You’ll then be asked for your personal registration information. Fill this out and click Submit. If you are unable to register via the website, please contact [email protected]. This project is connected to Sue Mach’s sabbatical and there will be no fees to participate in the storytelling workshops. Sue Mach has an MA in Playwriting from Boston University. Her first play, Monograms, was produced at Theatre for the New City in New York City, the Bloomsburg Theatre Ensemble in Bloomsburg, PA, Portland Repertory Theatre in Portland, OR, and the Icaras Theatre Ensemble in Ithaca, New York. The script, published by Rain City Press in Seattle, also received a Portland Drama Critics Circle Award. Her second play, Angle of View, was a finalist for the Oregon Book Award and received readings at Portland Repertory Theatre and Boston Playwrights’ Theatre. For her third play, The Shadow Testament, she received a Woman Writers Fellowship from Literary Arts. This piece has been workshopped by Artists Repertory Theatre in Portland, OR, A Contemporary Theatre in Seattle, Boston Playwrights’ Theatre, and JAW/West. It was produced by Portland World Theatre as part of The Fertile Ground Festival, and most recently at Clackamas Community College. Her play, The Difficult Season, a collaboration with renowned jazz pianist and songwriter Dave Frishberg, was workshopped at Artists Repertory Theatre. She was awarded a fellowship from Oregon Literary Arts, as well as the Oregon Book Award for her play, The Lost Boy, which was also part of Portland Center Stage’s JAW/West development series and received its world premiere at Artists Repertory Theatre. Her play, A Noble Failure, received a world premiere at Third Rail Repertory Theatre. Ensemble Studio Theatre in New York also produced a staged reading. Most recently, Sue’s adaptation of the classic Charlotte Perkins Gilman short story The Yellow Wallpaper was produced at CoHo theatre in Portland, and is a finalist for the Oregon Book Award. Additionally, Sue has received grants from the Regional Arts and Culture Commission, the Oregon Arts Commission, and the Oregon Council for the Humanities. She has been teaching literature and composition classes at Clackamas Community College for the past twenty years.